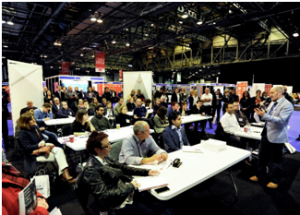 Why visit the Scottish Business Exhibition? The Scottish Business Exhibition is the event for ambitious Scottish Businesses. The free show gives your business access to all the suppliers, support organisations and partners you need to increase your profitability and drive your company forward. The impressive line up of seminar speakers includes the best of Scottish Business. Be inspired as you learn from the country’s most successful business professionals and develop valuable skills to transform your company in our interactive workshops. You want to improve your business or develop your skills! Find the right advice – with over 80 free seminars from an outstanding collection of successful entrepreneurs and experts. All the suppliers and support organisations you’ll need to improve your business. Develop your business skills – take part in our comprehensive and interactive workshops. Build new contacts – both the networking and coffee areas give you the opportunity to interact with thousands of business owners and managers. Get straight answers – talk to real business owners from real businesses. Stay up to date – demonstrations of the latest products and technology.